"Democracy has collapsed in Odisha. Under (Chief Minister) Naveen Babu, MPs and MLAs stand as servants, while the babus (bureaucrats) run the state," Shah said at an election rally in Dhenkanal. "Bring the BJP government in the state if you want to end this babu raj," he said. He also criticised the BJD government for not implementing the Ayushman Bharat Yojana. "The BJP government has launched Ayushman Bharat scheme to give 50 crore people free treatment up to Rs 5 lakh. But Naveen Babu did not implement the scheme due to the fear of Modi," said Shah. Referring to recent attacks on BJP workers, he said, "I want to tell the BJD if they think they can intimidate us by attacking our workers, the BJP knows very well how to reply without resorting to violence." "The Congress ruled Odisha for years. You have given 20 years to the BJD. 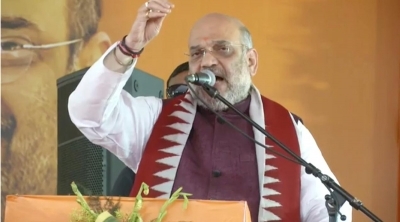 Give the BJP just five years and we will make Odisha the number one state in the country with double-engine growth," said Shah.